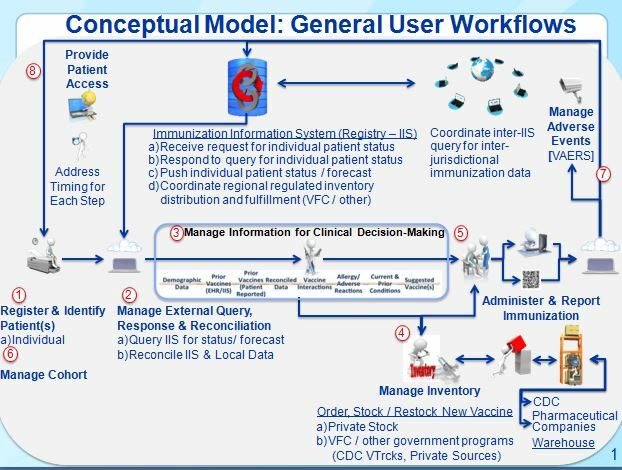 The immunization-related requirements are organized within eight user workflows, which together constitute the end-to-end workflow for providing immunizations to patients. Providing the right immunization(s) to a patient at the right time requires actions by people and information sharing among software systems. The following diagram shows the end-to-end workflow for providing immunizations to patients. Some tasks are performed exclusively by people, such as immunization providers; other tasks incorporate EHRs and/or other clinical software. The Exhibit below presents the actions performed by providers and IIS’ to provide immunizations to patients.